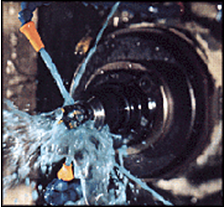 Davies “LUBRA-KOOL,” a synthetic machining lubricant, is designed to cover a wide spectrum of machining applications. Machining operations, such as milling, drilling, cutting etc. all apply to “LUBRA-KOOL.” A wide variety of stock metals can be machined with this versatile coolant. Surface finish and tool life are maximized due to the unique EP properties of this product. A synergistic blend of components has been formulated to achieve optimum lubricity, EP, and corrosion protection. “LUBRA-KOOL” has been fortified with effective microbes to resist bacterial and fungal growth, which will promote longer fluid life. The specific gravity of “LUBRA-KOOL” is 1.05 and pH is 9.5. The dilution of “LUBRA-KOOL” depends on the severity of the machining operation, metal type, and other machining conditions. A good starting dilution is 1:20. Concentration may need to be adjusted to fit individual machining conditions. Concentration is easily measured with standard refractometers, with typical readings in the 1-3% BRIX units range.